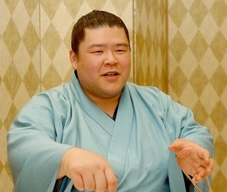 When he entered professional sumo in March 2007, one of the acknowledged objectives of Tosayutaka (Yuya Morishita, aged 22, Juryo 12 west, Tokitsukaze-beya) was to catch up with Ichihara and Mori. The latter (Tomoki Mori, aged 22, Makushita 14 east, Oitekaze-beya) joined the professionals at the same time as Tosayutaka, but the prizes he had won allowed him to make his debut at Makushita 15 tsukedashi. Tosayutaka was a high-school yokozuna and won several titles with his university, Nodai, but that did not grant him the same privilege. One year later, Tosayutaka has in fact surpassed Mori and is entering the juryo division in fine fashion: he has equalled the record for the fastest accession to juryo (six tournaments including maezumo) and takes the record for the number of consecutive wins in the unpaid divisions (30 wins between Natsu basho 2007 and Hatsu basho 2008). It is unnecessary to say that it is as a hero that he has been welcomed home to Kochi prefecture, where they are definitely celebrating now. On the 30th of January, Tosayutaka, who will fight in the juryo division at the Haru basho, appeared at a reception given in Kochi in honour of Toyonoshima, his senior at Tokitsukaze-beya, also from the region. Initially Tosayutaka was thinking of behaving as Toyonoshima's servant, but eventually he took up his position at Toyonoshima’s side at the front of proceedings, as befits him. Kochi Shimbun took advantage of this to ask him a few questions. Kochi Shimbun: You are rising very rapidly through the ranks. Tosayutaka: I am still quite calm, but it is a dream which I started to have more or less clearly since college which is now becoming true. I believe that I have above all improved the strength of my concentration. For now I have only a chonmage but I want to wear an oicho very soon. KS: Could you summarise your Hatsu basho? Tosayutaka: Before the tournament I injured my right pectoral muscle and I could not bring my arm close to my side. I could only do yori and tsuri. When I fought, my muscle made a funny noise. I succeeded in suppressing the pain with analgesics and suppositories. The first bout (against Yoshiazuma) and the fifth (against Hokutokuni) leave a particular impression on me. I beat Yoshiazuma although I was quite nervous because I thought about promotion to juryo. Against Hokutokuni, I thought of my training sessions before the tournament where I was terrible and couldn't stop losing against him. After the tachi-ai, he took me directly to the edge of the dohyo, but I didn't go out. I was not discouraged. Quite honestly, when they announced my promotion, I was surprised. KS: You lost your sixth fight, against Aran, and with it your chances in the yusho race. You also lost your seventh fight, your first confrontation with a rikishi from the juryo division. (Ed: Kirinowaka). Tosayutaka: Against Aran, I moved off to the left. It was a shame that I was unable to connect with a hataki. For the seventh bout I was nervous and my moves were uncoordinated. I received the ritual water for the first time and I had no idea what to do. My shiko too were not very stable. Each time I won, the papers talked about it a lot. In the end, I really felt under pressure. But when I was on the dohyo, the public cheered me on more and more and it was really very pleasant. KS : To what have you learned to pay attention during your professional sumo debut? Tosayutaka: Certainly getting very low for more power and going further at the tachi-ai. It is pleasant doing all those things which stimulate you every day when you train very seriously. I want to learn by watching (Ed: minarau) things like the double mawashi grip that Toyonoshima does so well. KS: At the next tournament, for the first time you will be fighting all 15 days. Tosayutaka: I am a bit worried about my energy levels and the strength of my concentration but I am impatient. I want first of all to get my kachi-koshi so that I won't get demoted. I want to get some good wins using my preferred technique, throwing. But my throws are not effective when I do not manage to apply the pressure in yotsu-sumo. So I must improve that too. I also want to pay more attention to protecting my jaw when I receive tsuppari.